Make sure you have something newsworthy. Format: A clear format, with a film logo and news feel to it. Date it: In the top right it has a release date (in this case 23 April 2009). This is especially important if you don’t want your news released until a specific date, and makes it newsworthy. A bold and interesting headline. Find the key most interesting aspect of your news that will catch the newspaper’s attention. 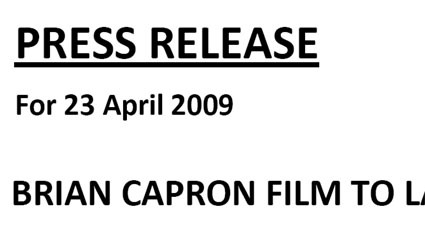 In this case it was popular local actor Brian Capron’s name. The first sentence of a press release should be a short summary of the news. The following sentences and paragraphs provide supplementary information. Provide clear and detailed information, with full names, dates and locations. Spell check and ensure it reads like an article with appropriate grammar. Don’t use unnecessary flowery language and keep it objective –use an impartial voice. If you want to include opinion you can create your own quotation, as seen here with a quote from the director, as if he had been interviewed. This saves time for the journalist –they don’t have to call to get a quote! At the end provide contact details for more information and if possible always say that cast and crew are available for interviews. Send by fax and e-mail (PDFs are ideal).